Our comfortable 2 bedroomed gite is ideal for couples and families with one double and one two (third bed available) bedded room , upstairs bathroom with shower over, downstairs shower room. Fully fitted kitchen with dishwasher, washing machine, fridge and microwave. large open plan living, dining room with wood burning stove and sofa bed which sleeps 2. Patio doors to decking area with garden furniture and private rear garden. Solar heated swimming pool, which is shared with the owners, various games and table tennis. The local bar 1km away sells bread and other staple foods. We are located by the Nantes-Brest Canal ideal for walking, cycling and fishing, permits can be purchased at the bar. Also there is the foret de branguilly just 1km away with lovely walks. Up to 2 well behaved dogs welcome. We bought this property originally as a holiday home because of the scenery, the silence and the proximity of the canal, but we loved it so much we all moved out here permanently in 2006 and still love the area just as much. We love the walks along the canal and in the woods as each day seems to be different, and so much bird life, as well as red squirrels, deer and wild boar! The cottage whilst attached to the rest of the property with a barn in between is completely self contained with a private west facing fenced garden. There is an upstairs bathroom with over bath shower and WC, downstairs there is a shower room with WC. The kitchen is fully fitted with washing machine, dishwasher, fridge-freezer, microwave oven, gas cooker, toaster kettle and coffer maker. There is ample crockery and cutlery. Outside: Outside there is a private deck to the rear with garden furniture and a barbeque and large private garden which is fenced and secure for children and dogs. There is access to the 5 x 8 metres solar heated pool which is shared with the owners . The table tennis is located at the front of the cottage. Cleaning / Towels / Linen / Maid service: All bedding and towels are supplied and changed weekly. End of let cleaning is included. Owners Pam, Derek, Sharon and Pete greeted us on arrival with a lovely bottle of wine and log fire. After showing us around the gite, they left us to our own devices and that is the way the week went. They were more than happy to chat, give advice as and when we wanted but did not intrude. The property was fully equipped and came with all those little essentials that everyone needs but is usually lacking in such properties. The location right next to the canal is absolutely beautiful and provides an excellent base for touring the rest of Brittany as you as slap bang in the middle. We very much appreciated the fresh asparagus that Derek cut for our BBQ and would highly recommend this property. Last but not least, we mustn't forget Bertie the dog - once again always on hand to give and received affection as and when wanted but otherwise stayed put of our way. A lovely weeks holiday thank you. Thank you for such a lovely review. It was lovely to meet you all. Bertie loved the steak and sausage. It is about 1 hours drive to the north and south coast with lovely sandy beaches and restaurants. The nearest airport is Rennes which is one hours drive, and Dinard Aiport is hour and a half away and the nearest ferry port is St Malo again about 1 and a half hours drive. We have a discount number to quote for Brittany Ferries. Rohan is the closest town about 5kms with all amenities. 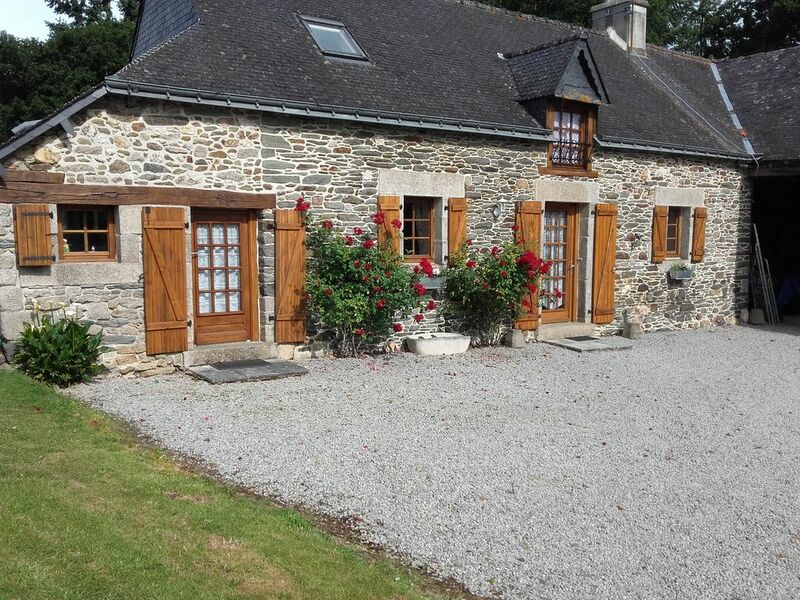 Pontivy and Loudeac are about 15kms with weekly markets and and town.centres with a good variety of shops. Lac Guerladan offers water sports and beaches. STOP PRESS. For all you cycling fans we have just heard that the tour de france is passing through our village on the 11th July and the village is making a day of it.